The rate of technological change in our world is rapid. Developments in mobile technology, electronic healthcare systems, our ability to use large amounts of data, the possibility of artificial intelligence and our use of IT to make clinical decisions are all evidence of this. We need to consider our response to this phenomenon as a profession and as professional leaders. And, to make the best of emergent technology, we need to update our thinking so we can recognise its potential to support and transform how we work. Patient power will change too, with patients able to access information we hold about them more easily, and contribute to records directly from devices and wearables. This creates new challenges in healthcare delivery. How we use data is increasingly important. Many of us will have recorded information in nursing and midwifery documents, perhaps using an old paper-based index-card system, but information today has a much longer shelf life. Data we record in single records, with consent from patients, can be combined with data from elsewhere to create a rich seam of material. This will help us find ways to improve care, support research and share care records with patients and clients. The information we record is no longer locked away, never to be looked at again, so our professional responsibility for matters such as data quality, the structure of nursing records and data standards has changed. ‘Big data’ and machine learning could help us manage workforce deficits through new developments of, for example, sophisticated clinical-decision support technology that enables us to make safer and better choices. This is a challenging time for us as professionals, but most people recognise that technology is a critical factor in modern healthcare systems. The Five Year Forward View (NHS England 2014) repeatedly refers to technology as an enabler of new approaches to care delivery and transformation, and reinforces the need for us to use data to make services safer and better. Over the years, the technology agenda has focused on what is called ‘clinical, or nursing, informatics’, but now ‘digital’ is used as a more encompassing term that reflects areas of potential beyond electronic health records. These involve, for example, the fields of genomics and personalised medicine, different ways of transacting services with patients, such as telemedicine, the use of wearable devices and the computerisation of large data sets. The profession needs to step up and grasp these challenges without compromising the essence of nursing. We need to create a vision of a future that includes technology as an enabler of modern practice. A review of NHS use of technology (Wachter 2016) makes it clear that, despite good progress in some areas, notably general practice, the health service in England has some way to go in making the most of technology. Although the review focused on care in hospitals, the same is true of most healthcare settings; we need to maximise the potential that data and technology offer. So what is happening to help the profession grasp this opportunity? The chief nursing officer for England’s framework, Leading Change, Adding Value (NHS England 2016), points to the importance of data to examine how we reduce unwarranted variation. Commitment 10 highlights the need to use data to improve outcomes for patients and service users. As a profession, the ability to see data as a critical nursing tool has never been more important, but it requires new skills and a focus on standards and data quality. 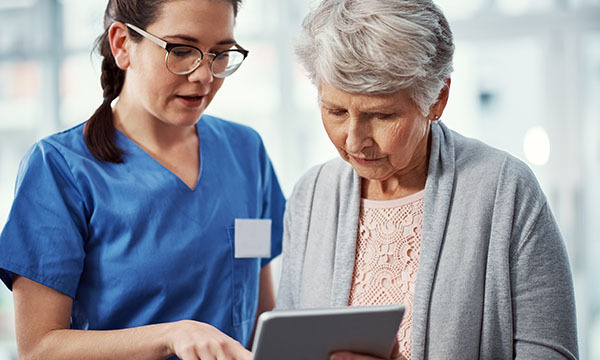 In many organisations nursing informaticians, or nurses who specialise in the use of technology and data, are not yet critical members of the broad nursing team, but there are signs of change. Specialists, playing an important role in ensuring the profession can make the most of the opportunity that digital provides, are starting to emerge. They are most obvious in secondary care where there are now entire hospitals in which nursing care is paper free, where technology is used to identify and manage deteriorating patients, and data used to manage safety and patient flow. Meanwhile, nurses in community settings are getting to grips with mobile working, and those in public health are recognising the opportunities that digital tools can create for health and well-being. Other nurses and midwives are becoming digital innovators, and looking to create digital tools that can add value to patients’ experiences. We need to nurture and encourage these professional behaviours. Nationally, we are investing in leadership for professionals in the digital field. The development of the NHS Digital Academy signals the need for leadership development on a grand scale and for the creation of leadership programmes to enable a new cadre of professionals to lead the emerging agenda. The review by Wachter (2016) has also led to a change in how we invest in technology, creating a new programme of global digital exemplars who will be internationally recognised NHS care providers, delivering efficient, exceptional care through the world-class use of digital technology and information flows, within and beyond their organisational boundaries. They will also be reference sites for other care providers. These developments create opportunities for nurses and midwives to become involved in new digital transformations locally and regionally. It is fair to say that we still have some way to go, but there are signs that the profession understands the need to step up. The use of new digital tools and the availability of data create a fantastic opportunity for the profession that we must embrace. Forget your digital prejudices, embrace what the digital revolution creates for the sake of citizens and patients.